VMware has released new versions of its desktop virtualization products for the Mac and PC that bring support for Windows 10 and an enhanced graphics engine. 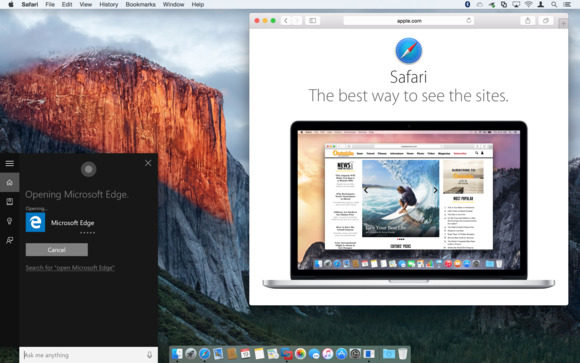 The company's Fusion line of software that lets Mac users manage and run virtual machines has been updated to version 8, while the Workstation line of Windows virtualization applications has been updated to version 12. The refreshes come right after the launch of Windows 10 last month, and unsurprisingly bring support for running Microsoft's new operating system in a virtual machine. 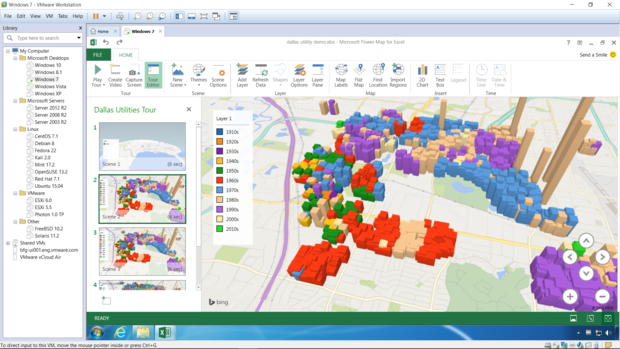 Microsoft PowerMap running in a Windows 7 virtual machine through Workstation Pro 12. PowerMap requires DirectX 10, which is newly supported in VMWare's latest desktop virtualization products. One of the key upgrades added to VMware's PC and Mac virtualization software is an improved graphics engine that brings support for Microsoft's DirectX 10 and OpenGL 3.3 and improves performance for graphics tasks that the previous versions of the software were able to handle. In addition, both the Fusion and Workstation lines bring support for up to 16 virtual CPUs, 64GB of RAM and 2GB of video RAM per virtual machine. It's a change that will let owners of high-powered hardware bring more of it to bear when running virtual machines. Users with encrypted virtual machines will find that they're faster to suspend and resume with the new updates, which should be a boon to security-conscious folks. VMware also took the opportunity to change the names of its PC desktop virtualization products with this update. Workstation has now been renamed to Workstation Pro, while Player Pro is now Workstation Player. The change is supposed to make it easier for people to understand the offerings. As the name implies, Workstation Pro is meant for power users like IT professionals and developers, while Workstation Player is designed for deploying managed virtual machines to end users in an enterprise. 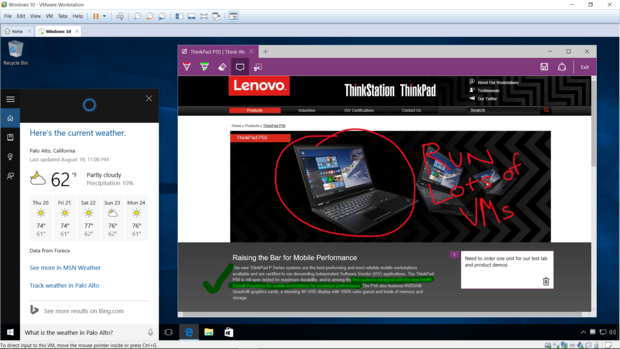 Windows users who have touch devices can wield those capabilities inside virtual machines using Workstation Pro and Workstation Player, so they can take advantage of new features inside Windows 10 like the ability to draw on web pages inside Microsoft Edge. On the Mac side of things, Fusion and Fusion Pro 8 will let users summon Microsoft's voice assistant Cortana from the Mac desktop when they have a Windows 10 virtual machine running. The update also supports running on OS X El Capitan, along with virtualizing Apple's forthcoming operating system. Like past versions of the software, users can run Windows apps alongside Mac apps using Fusion's Unity feature, and this upgrade also adds a refined installer so that it's easier for people to set up new virtual machines. Fusion Pro 8 includes features tailored for power users, developers and IT professionals, like support for IPv6 so they can test how the new networking standard works before rolling it out across a company. People who bought the immediate predecessors to the updated applications on or after July 29 will get a free upgrade to the new versions. Parallels users interested in switching to Fusion can get 40 percent off the purchase price of a new version of either Fusion 8 or Fusion Pro 8. A new copy of Fusion Pro 8 will cost US$200, while its consumer-oriented sibling costs $80. Workstation 12 Pro costs $250, and Workstation Player is $150. Users of the two most recent versions of VMWare's desktop virtualization software, including Fusion 6 and Workstation 10, will get discounts on upgrading to a new version of the software. On top of all the desktop pricing, people who purchase Fusion Pro 8 or Workstation Pro 12 will get $600 in free credits for the company's vCloud Air cloud platform or six months of free vCloud Air service, whichever runs out first. It's twice what VMware offers new users of its cloud platform, and could draw in new customers for the company's cloud business at a very competitive time in the cloud market overall.